Happy Saturday Pop Culture fans! Here’s your daily dose of pop culture for #BigSell30. We had such a great time talking to Alan Noah of The Test of Time podcast last week, so we brought him back to give us another Big Sell. 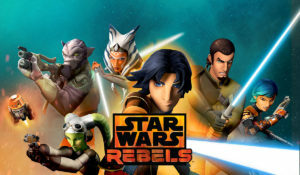 This time, he suggested the Disney XD animated series, Star Wars Rebels. He also somehow snuck in a Big Sell for Star Wars Clone Wars in the middle of our conversation too! And definitely check out Alan’s podcast- this week’s episode dissects the John Hughes classic, Sixteen Candles. Don’t forget to tweet us @PopInsiders to give us your Big Sell and also let us know how #BigSell30 is going for you!